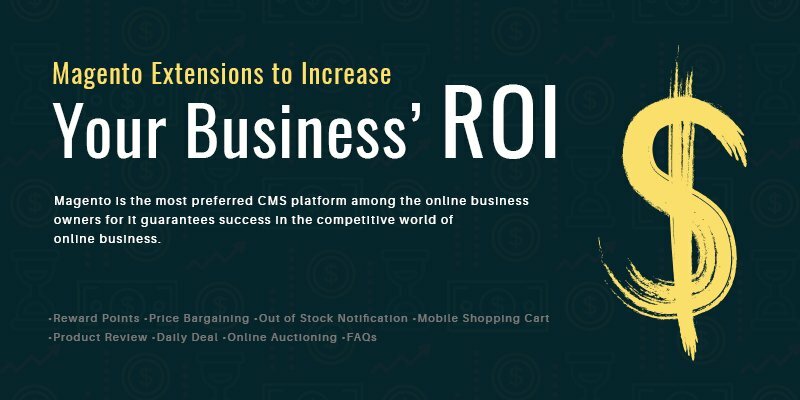 Magento is the most preferred CMS platform among the online business owners for it guarantees success in the competitive world of online business. The major advantages of Magento as a CMS platform include customization, flexibility, user-friendliness, speed, multi-site functionality, scalability, performance, tracking facility and cross-selling features. All these features and functionalities help e-tailers to make their websites accessible, intuitive and conversion-centric. In order to enhance the visibility, attract new customers and retain the existing ones, Magento Module Integration plays a major role. Here are some of the extensions to boost your online business. Being a revenue-driven extension, ‘Reward Points’ serve as a loyalty program to increase target audience. Apart from expanding the market, it also helps in understanding various customer requirements thereby, retaining them easily. Offering the bargain option to customers drives them to stick to your products and services with contentment. It will lead in satisfying them because almost every customer wishes to get the desired product or service at the most competitive price. To ensure that customers are not let down due to unavailability of the products, the Out of Stock Notification extension is used. Online store owners can order the products, increase engagement with customers and predict demand of the product range. It helps in facilitating secured and smooth mobile transactions and also accept different types of debit and credit cards. It helps in protecting personal details and thus, helps you to gain customers’ trust. Product reviews play a major role in reaching prospective customers by increasing their trust over the company. Since reviews help in better understanding of the product, customers can take a better and faster decision on purchasing your products. Daily deal extension delights consumers by offering products at discounted prices. It leads to upselling along with the core focus on customer satisfaction. Daily Deal works as an effective upselling marketing technique and increases ROI. This is yet another revenue-driven extension that can help customers to be a part of auctions and biddings to get the product of their choice. This extension is preferred by most online merchants in order to keep the business more lively and interesting for the customers. This extension is definitely the one that can enhance shopping experience of your customers by making purchase hassle-free by answering relevant questions frequently asked by the customers. TargetBay is a conglomeration of a bunch of ecommerce extensions that can be availed as a group or in parts to focus on specific ROI improving opportunities. TargetBay has Magento-powered extensions for streamlining product reviews, marketing and retargeting emails, product recommendations and more. If you want to know how and when you need to integrate these extensions in your Magento-based eCommerce store, get in touch with our Magento experts.